Blackberry devices were handy life organisers in their day (some still swear by them), but can you imagine writing a novel on one? That's what Matt Bendoris did. The Chief Features Writer for the Scottish Sun newspaper tapped out his entire debut crime novel, Killing with Confidence, on a Blackberry during train trips. That tale involved a self-help book devouring serial killer, an aging technophobe investigative journalist and her young sidekick, and a detective 'with issues'. 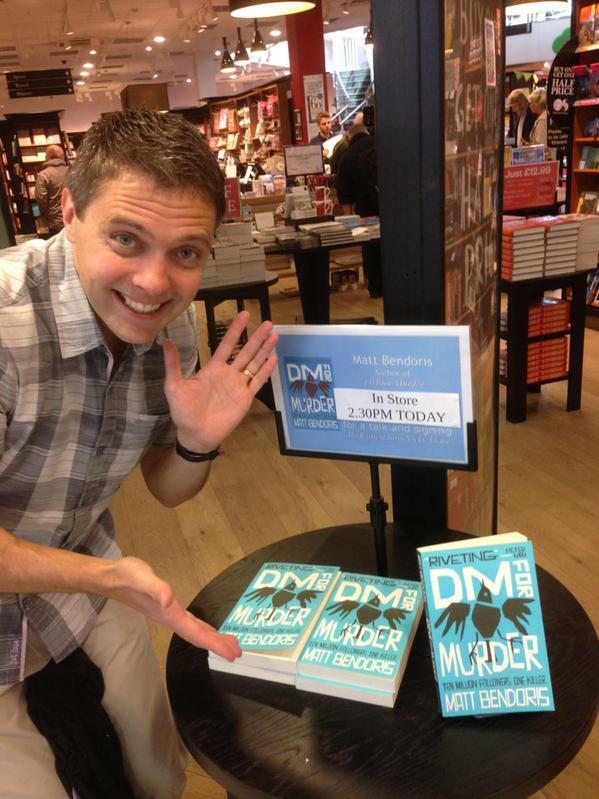 This year Bendoris released his second crime novel, DM for Murder, where a shock jock TV talk show host with 10 million Twitter followers is killed. Then the killer begins tweeting clues. "I don't know anyone else who has a social media murder in their books," said Bendoris earlier this year. "It was a real thrill to write." DM for Murder has received some huge plaudits and rave reviews, and is shortlisted for the Scottish Crime Novel of the Year Award - the winner will be announced at next week's Bloody Scotland festival in Stirling. But for now Matt Bendoris becomes the latest author to stare down the barrel of 9mm. 1, Who is your favourite recurring crime fiction hero/detective? I love Mike Ehrmantraut (played by Jonathan Banks) in Breaking Bad. Ok, technically he wasn’t a detective in Breaking Bad, but he was a cop in the prequel show Better Call Saul. The spin-off wasn’t as good as BB, but it lit up whenever Mike was in it. I like the fact he’s so economical with words, how worldly-wise he is, but with an air of menace and an explosive violent streak lurking just under the surface. Sorry he isn’t a literary detective, but most of my influences are from TV and film. Oh, that’s a tricky one. I’d maybe go for Frederick Forsyth’s The Dogs Of War. It is pretty sexist and racist by today’s standards, but those attitudes were considered more acceptable in the era it was first published in 1974. But what I really liked was that the twist at the end was clear from the very start, if only you knew what to look for. I also loved the African setting, as I have always felt a connection with the continent after immigrating to Rhodesia (now Zimbabwe, of course) as a baby, returning in my primary school years when my folks split up. Two published showbiz autobiographies, and one commissioned and written, but unpublished, diary of being a first time father. What they all taught me was the incredible amount of work that goes into every single book, no matter the genre. 4, Outside of writing, and touring and promotional commitments, what do you really like to do, leisure and activity-wise? I have run four marathons (my personal best is 3hrs 36min), and I astounded myself by coming 28th out of 5,000-plus runners in the Edinburgh 10k in 2013 – completing it in 41mins 47secs – not bad for an old git. Well, my home town is now Kilsyth, so I was highly recommend visitors walk up the Tak Ma Doon Road, to the view point, then back down again for a meal and pint in the splendid Coachman Hotel. If anyone is ever visiting, let me know and I’ll join you for a beer. Chris Pratt. Not that we look alike, but purely because I thought he was great as loveable Andy in Amy Poehler’s Parks and Recreation series. Without a doubt, my latest, DM For Murder. I feel it’s far more professional than my debut crime novel, Killing With Confidence, which is all down to the slick little operation that is Contraband publishing with their dedicated, expert staff. Chuffed, of course. Sadly I later realised getting on the bookshelf is only half the battle! Selling books at another author’s launch. It is apparently the ultimate faux pas, but I swear it wasn’t my fault. A couple of crime fans recognised me (I don’t know how) and asked me to sign my books for them. Once again, sorry about that Douglas Skelton, but a sale’s a sale!